A hard-hitting and action-packed gangland thriller, White Heat boasts an absorbing story, enduring characters and James Cagney in top form. Cody Jarrett (Cagney) is a ruthless, psychotic gang leader. He leads his mob on a daring armed robbery of a mail train in the California mountains, killing several innocent men in the process. Cody is unhappily married to Verna (Virginia Mayo), but his real, intimate attachment is to his Ma (Margaret Wycherly). Despite the large cash haul secured from the train robbery, there are deep divisions within Cody's gang, amplified by the need to hide out in a cold mountain cabin. His second in command "Big Ed" Somers (Steve Cochran) has ambitions to usurp Cody's authority, and Big Ed also has his eyes on Verna. By tracking Ma's car, US Treasury investigator Philip Evans (John Archer) closes in on the gang's hideout, forcing Cody into the open. To escape facing justice for multiple murders, Cody confesses to a lessor non-violent crime and is sentenced to a relatively short stint behind bars. Evans is not fooled, and inserts undercover agent Hank Fallon (Edmond O'Brien) as Cody's cell-mate to keep tabs on Cody's plans and uncover the identity of his money-laundering associate. Hank gradually gains Cody's trust, and just in time. Despite Ma's best efforts, Big Ed and Verna forge an uneasy alliance and make their move to usurp Cody, who breaks out, retaliates and plans his next big job: a payroll robbery at a chemical plant. 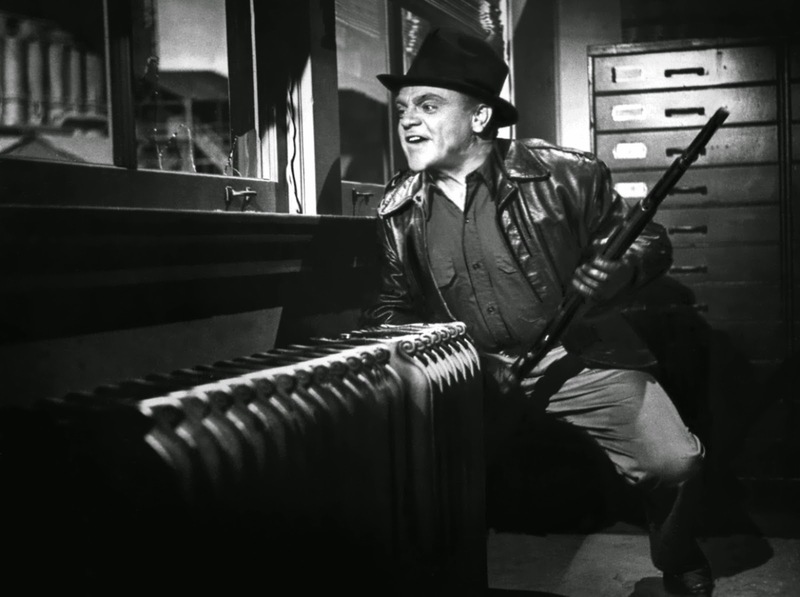 Perhaps the finest example in Warner Bros. long catalogue of hardboiled crime thrillers, and a magnificent highlight in James Cagney's career, White Heat is a complex, gripping tale of rampant gangsters and the policemen charged with tracking them down. Director Raoul Walsh expertly constructs a compelling three-act drama over almost two hours, with no wasted moments and a level of tension than increases as Cody's options are gradually diminished. With a finely polished script by Ivan Goff and Ben Roberts, the first act introduces Cody, the gang, wife Verna and Ma, and it is the uncomfortably close relationship with Ma that immediately jumps out as the biggest influence in Cody's life. As he suffers from severe migraines, it is Ma who comforts him, encourages him to get to the "top of the world", and advises him on how to manage his gang members. Meanwhile, Cody treats the luscious Verna with nothing but disdain. The second act switches gears to life in prison, and Walsh patiently allows Hank to gain Cody's trust, no easy task when Cody's natural instinct is to suspect everyone. It's a careful, layered process, police work at its best within the jungle rules of incarceration. White Heat is notable for highlighting excellence in advanced police techniques, including the use of multiple unmarked squad cars to surreptitiously track Ma's vehicle, and then radio signal emitters to remotely triangulate the location of a moving truck. And finally Walsh steers the film towards a sensational climax, Cody finding renewed resolve to reassert his authority, seek revenge on those who betrayed him and pull off a spectacular payroll heist, with Hank caught in the dangerous middle. Cody Jarrett emerges as a rounded, genuine villain, struggling against mental illness, the emotional scars of what must have been a twisted childhood, and frequent physical pain. 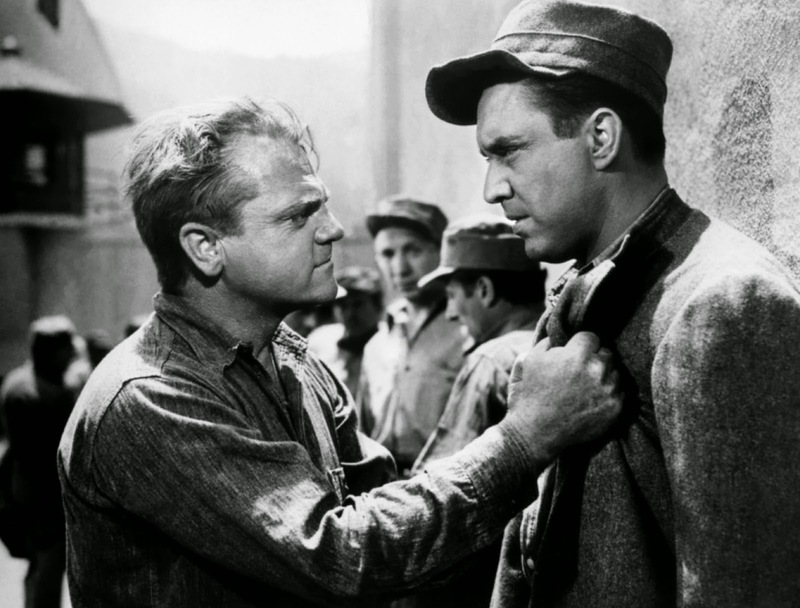 While never slipping into false sympathy, Cagney allows Cody to become a believable person never equipped to understand the feelings of his victims. Wycherly's role is small but unforgettable, a mother never seen to be violent but nevertheless capable of motivating her son to extremes of coldblooded cruelty. There is never any doubt that Ma is Cody's biggest cheerleader, and he lives his life to please her. With gritty, bullet-drenched and often explosive action driven by a psychotic criminal striving for the top, White Heat sizzles.